My friend offered to drive me to a meeting in Fitzroy on Saturday morning. She knows the area well and took us several streets away from the planned meeting place where the council offers four hours of free car parking. We pulled up alongside a high black van. I noticed this van in part because my friend took a while to get out of her seat and I went across to her side of the car to wait. When she finally opened her door, it slid ever so slightly against the side of the van, which was not only large and black but also very new in appearance. As my friend came towards me after she had closed her door, I saw the tiniest fleck of white on the otherwise pristine black wall of the van. I had no time to mention it to her nor was I certain that my friend’s car door had caused the fleck of white on the otherwise perfect exterior of the black van though I imagined it might. ‘What was that?’ I asked my friend. ‘Just some rudeness,’ my friend said, and we walked on up the street, but in my mind’s eye I could see the owner of the van kick in the door of my friend’s car or slash her tyres or some other act of revenge. The day took off from there, begun with an uneasy thought that we had done something wrong and that we might be punished. Only then I realised we’d parked in a four-hour zone. My friend parked there regularly she said, and so far, so good. She had not yet suffered the pain of a parking ticket. By days end, I was relieved to find there was no white ticket on the dash board of my friend’s car. But after my friend reached my house and we pulled into the curb on the side street nearby I urged her to park closer to the kerb for fear of losing one of her side mirrors as can happen in narrow side streets. I told her then about the man in the van and she seemed to have registered his presence. My friend said nothing other than it was bad luck. Maybe she was trying to save face in view of a bad experience but for me the memory has stayed. It seemed a cruel response to a tiny fleck of white paint, if indeed that was the cause, but it’s hard to think about it in any other way. I did not catch a glimpse of the man in the van. Nor did I have the presence of mind to take down his number plate. And what good would it have done? How could anyone prove this road rage? That evening, I toyed with driving back to the parking place alone to search the gardens nearby in the hope I might recover the rear of my friend’s side mirror. I still might be there, both as proof of the black van driver’s wrong doing, and also to fix a broken car. On the fourth anniversary of her death, here’s the eulogy I wrote for my mother. Our mother never made it to one hundred, as she so often told us she had wanted. She could go on living as long as her body held out and, mostly, she was comfortable and without pain, but these last three weeks have seen her stop eating, stop drinking, and eventually lose all will to live. Even then she held on as long as her body could. Our mother was a woman of her time. Her choices were limited. As it is with all of us, Mum was a complex person, with many different sides. The way she presented to the outside world, her warmth and kindness, her generosity and thoughtfulness towards others, made her loved by all those who came in contact with her, her friends in the parish, staff and residents at Park Glen, her bible study group, and many more besides. Our mother took pleasure in her appearance almost to the point of vanity. She loved to read and to play the piano. Her passion for the intellectual, her pride in her children, grandchildren and great children – her progeny – as her way of leaving her mark on the world, contrasted with her need to disappear into a well of optimism that sometimes excluded those most dependent upon her. Our mother had always loved to read, she told me. From the time she was a little girl, as young as eight years old, she raced for the front door as soon as the newspaper arrived at four o’clock in the afternoon, to beat everyone else to it. 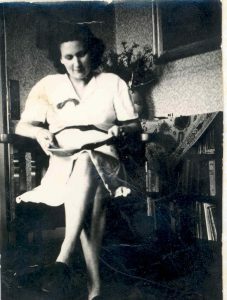 By then her mother was busy preparing for the evening, her father was still away at work, so our mother could have the whole newspaper to herself, being the oldest and being the only one in the world who loved reading as much as she. There were a number of things my mother told me, repeatedly every recent week when I visited her. She talked about her room, how lucky she was to have such a room. She told me how pleased she was to be able to have all her things around her, all her memories of life rolled up in one, the good things about her life, especially her childhood. Her wonderful childhood. She did not dwell on the awful aspects of the past, she told me, and nor should I. After all, she told me, there’s nothing she could do about it. It had happened, and some of it was awful, but it was over now, and her life was good. Still she wondered out loud from time to time how much longer she could go on doing nothing. At 94, she argued, what else could she do but sit and read? At least, she had her reading. She told me, again, how pleased she was to be able to sit in her chair and look out of her window at the small garden outside her room at Park Glen, and watch the trees change shape and colour with the seasons. Our mother hated to disappoint people. She wanted others to be happy to a fault. In her later years, she tried to reconcile what had happened throughout our childhood. Held hostage to a marriage that was abusive, within a dysfunctional household, she did not have many options. Catholic women did not leave their husbands in those days, nor was contraception an option, and my mother had no money. ‘Ten years ago, I wrote the story of my life, but now I know that I owe you more of an explanation of my feelings during the dark days of all our lives. I blame myself, not so much for when you were babies because I know that I looked after you all very well. ‘But as time went on, and your father’s drinking pattern worsened, I couldn’t cope with the horror, and started to read all day, everything I could lay my hands on, to stop myself thinking about the reality of the situation. And I didn’t see that I did not listen and see your needs also. Now I am old, I see this clearly and am so very sorry, because I know that all of you have suffered then and are in different ways affected by your father’s behaviour, and my reactionto this. ‘During that time, I started to work, first cleaning in Genezzano, which was physical hard on me, and after that, I got a good job in Allambie as children’s officer; only the hours were very long. From nine in the morning till five, but twice a week till eight at night. I was exhausted during those days, could never have done it without Gemma’s help. It allowed me to pay some school fees at the different colleges, because I wanted for all of you to have a good education. ‘A few years later I found Al anon, and with the help of many people, I managed to change my life; but this was after many years when most of you have left home. My mother was a woman of her times, and so you see these aspects that impacted on her made it hard for her to cope, but she did her best. Likewise, we can all try to find the peace that my mother sought in her later years. When I was young I thought my father ruled the house, but there came a time when my parents were around the age I am now, not long before my father died, when the tables turned. My mother took up voluntary work with the church, visiting impoverished families in the high-rise estates in Fitzroy. My father by now had retired. He did not like her going out while he was stuck at home alone. He did not want her to learn to drive, for fear she would never stay home. Instead he drove her in and out of the city from Cheltenham every day, in order that she should be near. The tables turned and my father, once the strong one, became the helpless, dependent one, right up until his death. And my mother grew stronger once he was gone. My mother to me is as timeless as the sun and she lives on in me, as traces of her exist in my children and further traces will exist in their children into the future. And so, it is for all of us here, memories of my mother remain.